As unwilling as you are to accept the fact, uncle Joe is absolutely right. Nowadays, the photography market is oversaturated. While companies and individuals worldwide need photo and video content on a regular basis, the supply continues to exceed the demand. As a result, photographers have to vie for a spot under the sun. How do you distinguish your business? Branding your artworks is one way to stand out from the crowd. In this article, we’ll talk about how to add a logo to your photo. Your logo is like your personal signature. 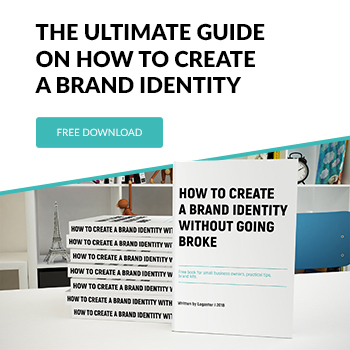 It can help you boost your brand recognition, promote your services, and protect your work from dishonest competitors. The Internet offers a stunning abundance of services that can help you add a logo to your photo in a minute. We’ve made a shortlist of the most user-friendly websites. We hope this will save you lots of time. Let’s get started! Watermark.ws deserves to be the first on our list. Simple and intuitive, this online service has more than 1 million users, which is pretty impressive. The free version allows you to add a logo to 5 photos or videos and use the basic editing tools (filters, crop tool, etc.). Plus, you can add any words to your photo, since the platform supports the Cyrillic alphabet. 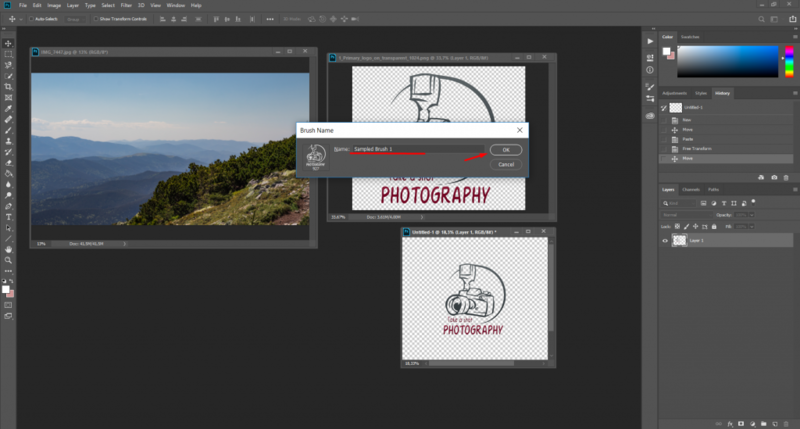 Simply upload your photo and logo from your computer or a cloud and then download the watermarked image. Thumbs up! 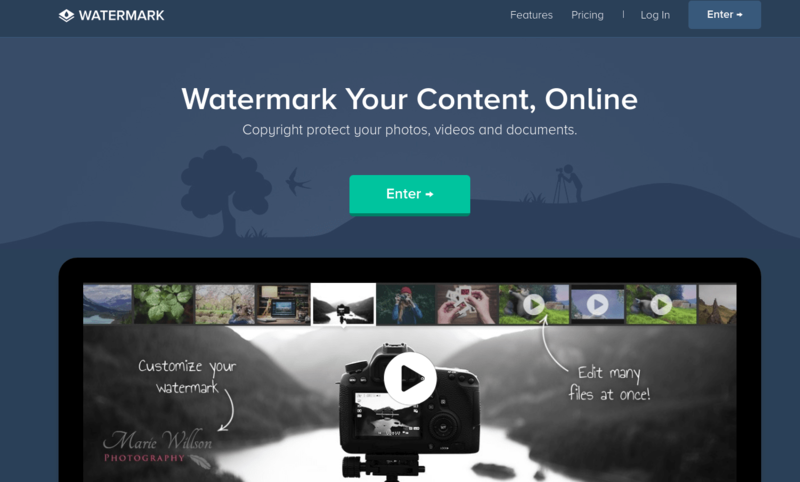 Watermarkphotos is another easy-to-use platform to brand photos in a few clicks. Here is more good news: it’s absolutely free! Instead of a logo, you can add a text or signature to your photo. The service features basic editing tools, but this is more than enough for the average user. Our take on Watermarkphotos? Precise and up-to-the-point. A must-try for all photographers! 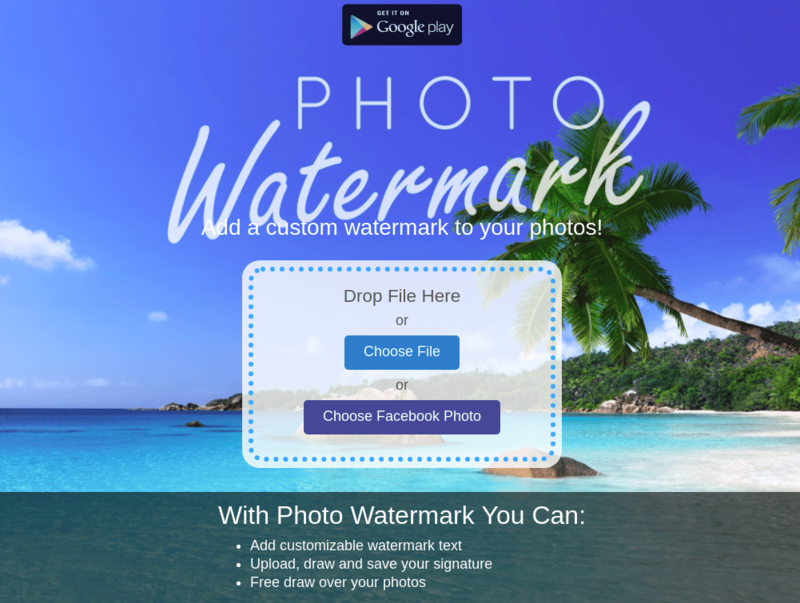 Watermarkly is a simple, fast, and free way to add a logo to your photo. 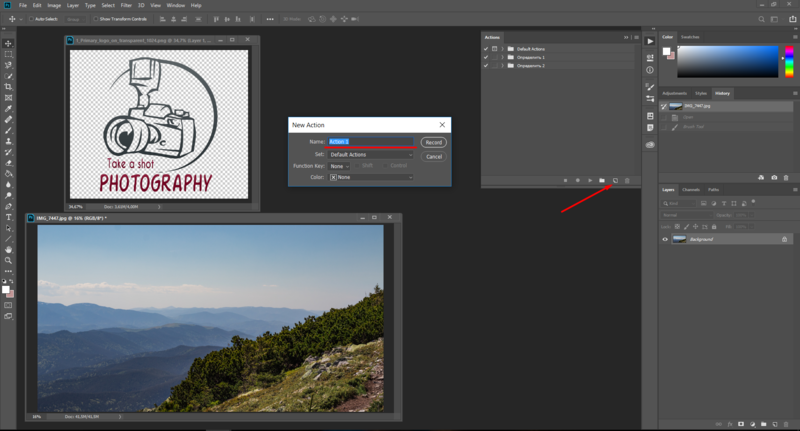 To do that, you need to import a photo from your computer, Google Drive or Dropbox, and drag your logo onto it. You can crop the logo and customize the transparency level. If you choose to add a text, you can edit its color and font. The best thing about this service is that it can brand multiple photos in batch. Think about how much time it can save you! There is no way we could leave out the iconic Photoshop. If you know this graphic editor like the back of your hand, good for you! 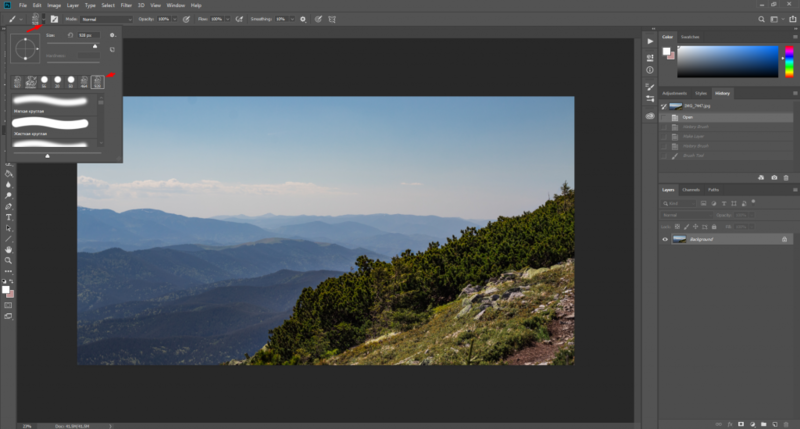 Still, some people get stuck when asked to watermark an image in Photoshop. Let’s find out how to do that! In fact, adding a logo to a photo is something even a schoolkid can do. Open your logo and photo in Photoshop. 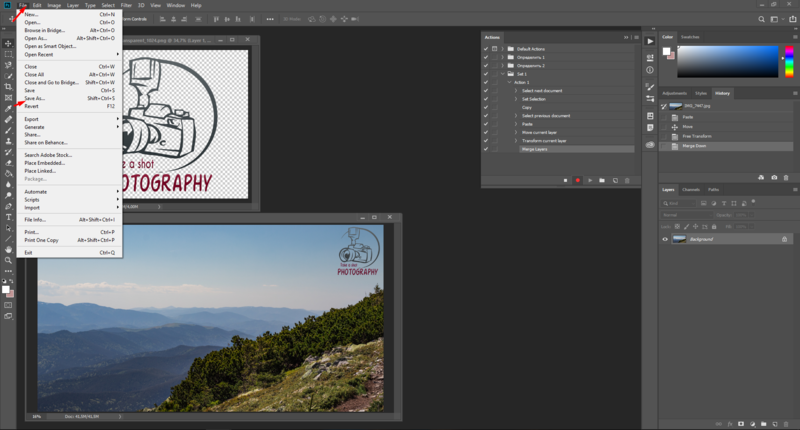 The easiest way to watermark an image is by using your logo as a brush. How do you do that? 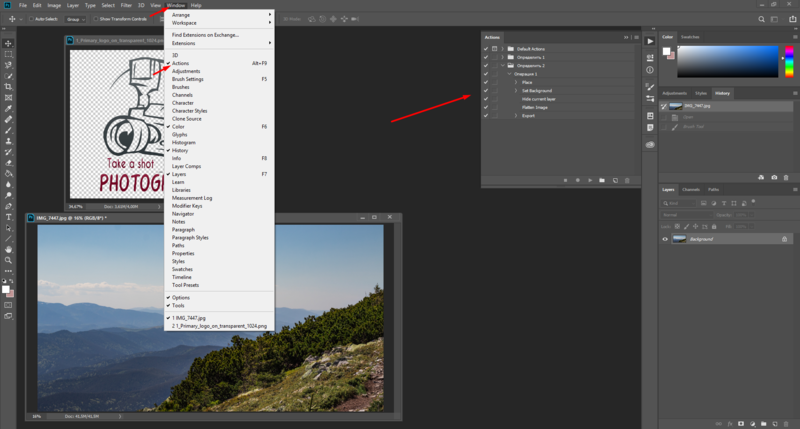 In the top menu, click File>Create. Customize the parameters of a new file. Set “Width” at 2,500, “Height” at 2,000, and “Definition” at 300. 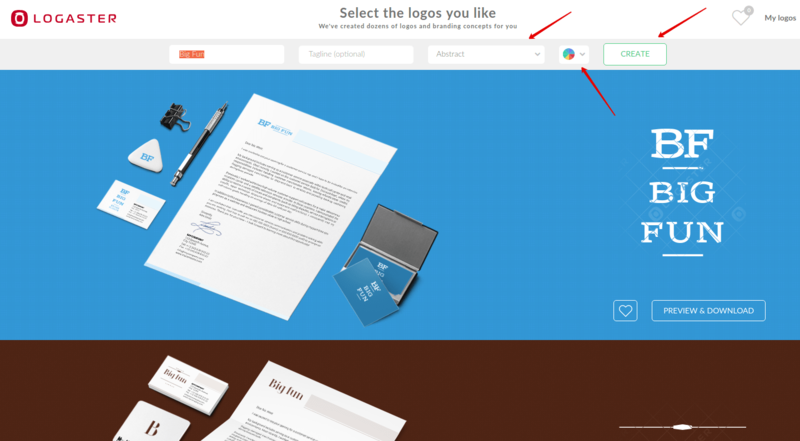 Click OK.
Add your logo to the new document. Resize the logo or add a text to it, if needed. 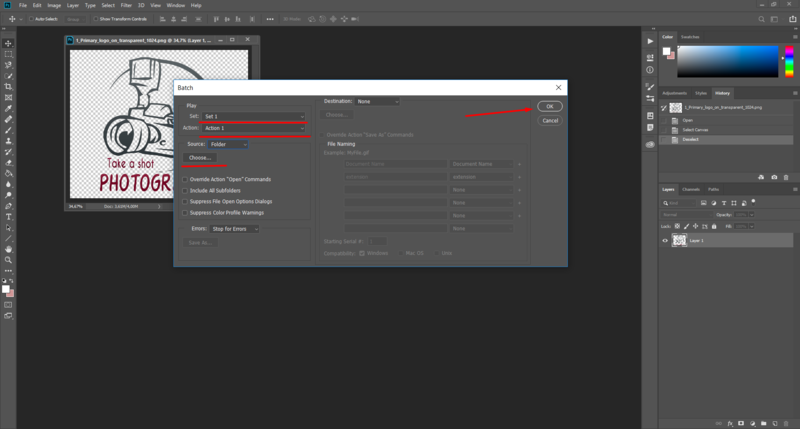 In the top menu, click Edit > Define Brush Preset. 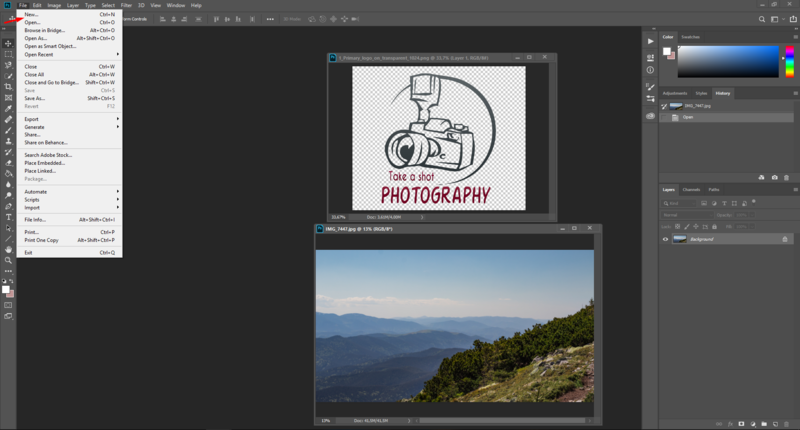 Name the brush and click OK. Now you can easily add your logo to any photo. Plus, you can customize it as you like, e.g. change its color, size, transparency, etc. Here is a great video tutorial to the same topic. If you prefer video content, be sure to check it out! You can also watermark multiple photos in one go. Let’s do it. Open your logo and photo. Now you need to record an action that will be repeated for all the photos. To do that, click Window >Actions. In the action window, enter the name of the action and click the red point to start recording. Click the logo or press CTRL+А, CTRL+С, CTRL+D. Now click the image and press CTRL+V. 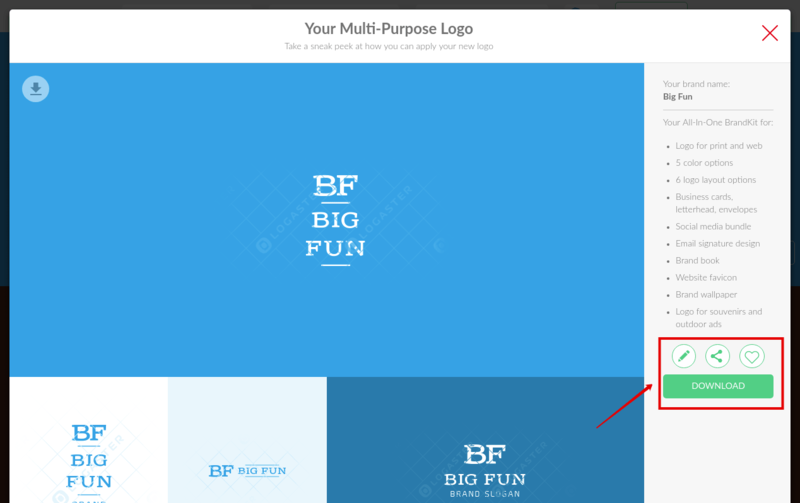 Adjust the size of the logo and arrange it in the right way. Then press CTRL+Е. To save the photo, click File>Save As. Then close the photo window and stop recording. Click File > Automation > Batch. Customize the settings and click OK. Then select a folder with the photos you want to watermark. Done! See how fast it was to brand your photos! Here is another video guide. The SALT app is a great way to add a logo or text to an image. The program works smoothly and is available in free and premium versions. 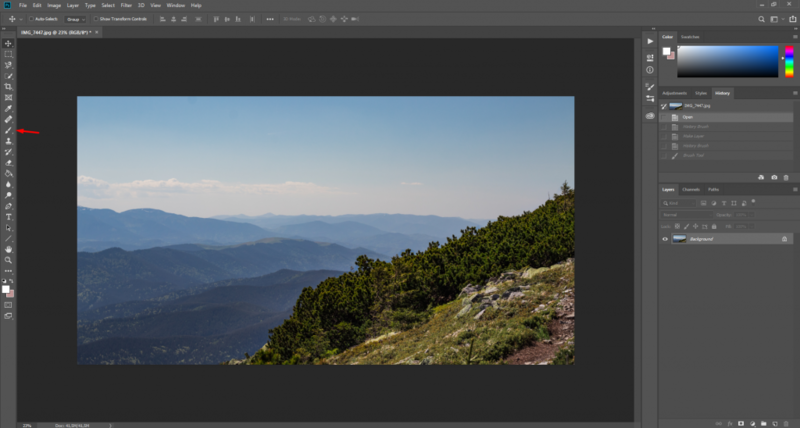 The free version offers limited editing, meaning you can make no more than 40 changes. 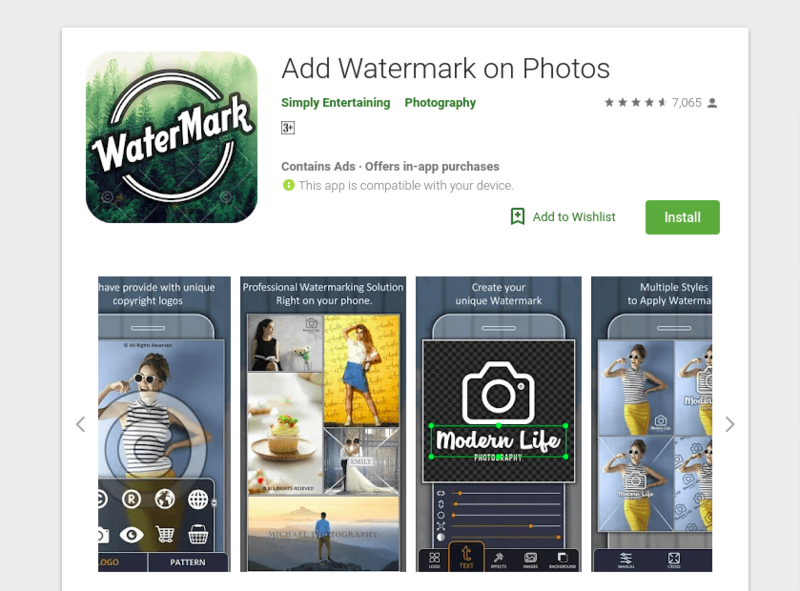 Use this free app to watermark one or multiple photos right on your smartphone. You can adjust your watermark or add a text, if you like. 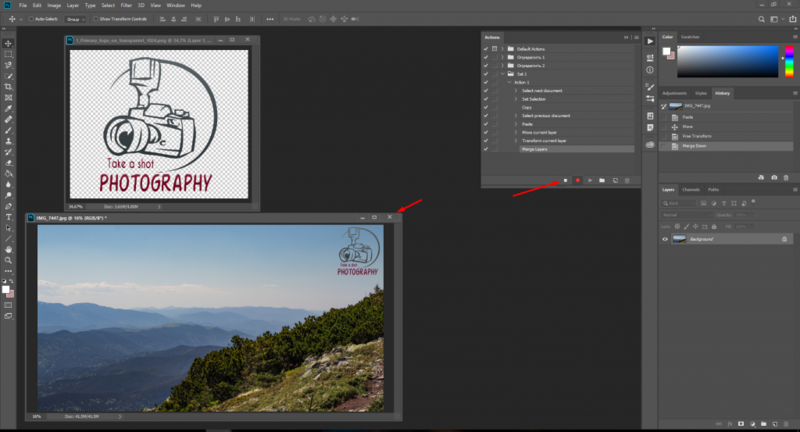 You can put your logo in the corner or across the entire photo for better copyright protection. LogoLicios is another fast and free app to brand your artworks. With it, you can watermark your photos with your eyes closed! Upload your photo and logo. Edit the image, if needed. Save the watermarked photo and share the beautiful result with your friends! The app supports PNG, JPG, and GIF files. This free app has a huge fan base. 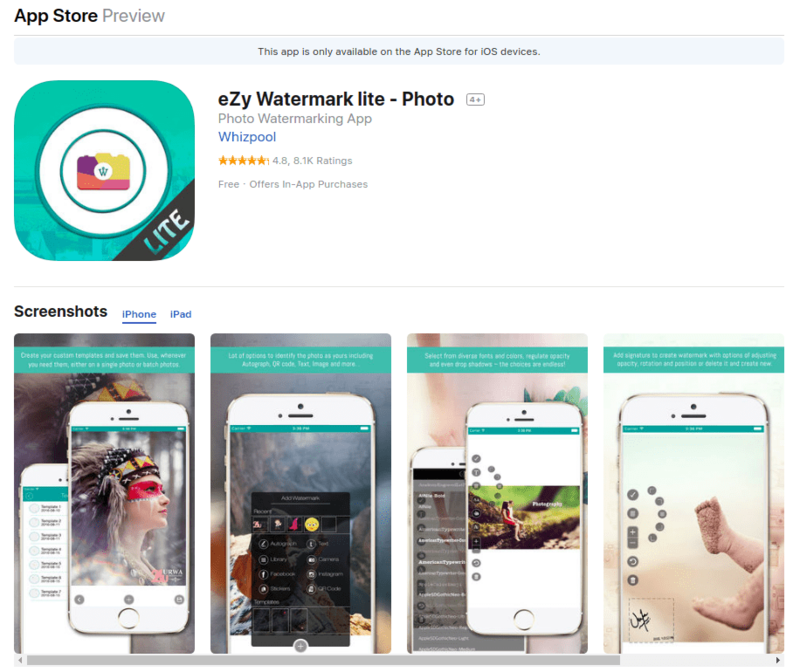 Over 3 million people are using eZy Watermark to brand their photos. You can upload an image from the gallery or social networks or take a picture with your smartphone right on the spot. If you don’t have a logo, an image, text, or even signature will do just fine! Plus, you have an advanced editing toolbox at your disposal. What else can you possibly need? A must-have app for every iOS user! 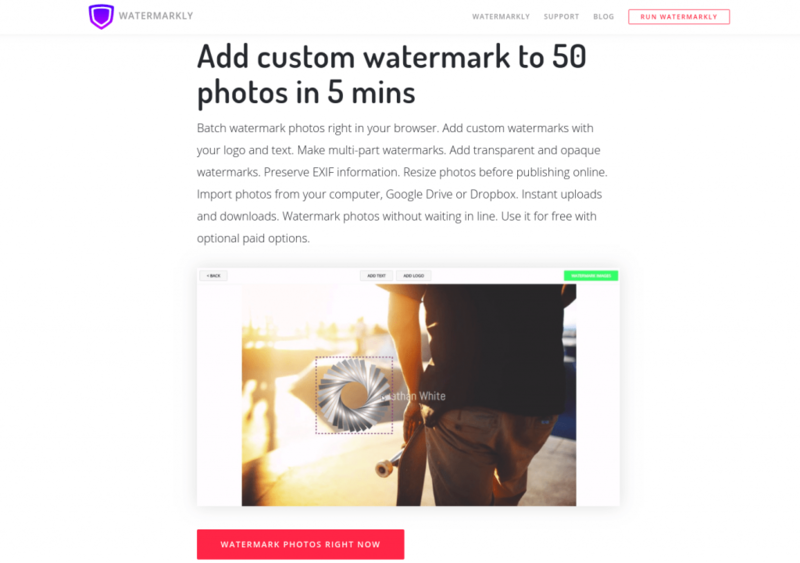 What if you need to watermark your photos but have nothing to brand them with? Don’t panic and take a deep breath. If you haven’t had the time or inspiration to create a logo for your photography business, we can help you with that. 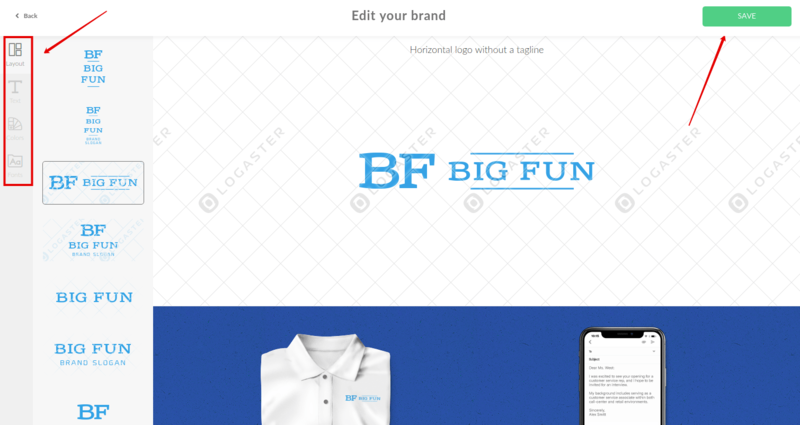 With Logaster logo creator, making a beautiful logo is a matter of 10 minutes. Most importantly, you don’t need any preparation or special skills to use Logaster. Thanks to the intuitive navigation, Logaster is a paradise for non-techies. Along with a logo, you can also create your corporate branded products, such as business cards and envelopes. Select your industry from the drop-down list and choose the colors you like. Hit the “Create” button. 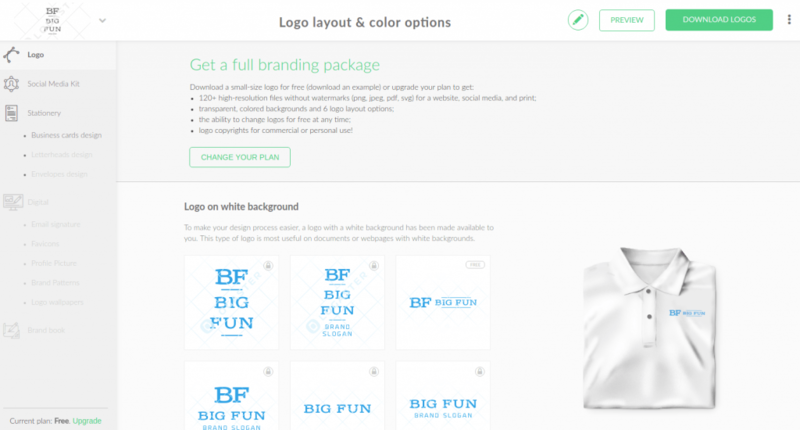 Logaster will show you dozens of your industry-specific logo samples. Pick any emblem that catches your eye. To edit the selected logo, click the “View and Download” button and then the Edit icon. You can change different parameters of your emblem, such as colors, font, etc. Now you can share your new logo with your friends, add it to Favorites, and save your design by clicking the “Save” button. 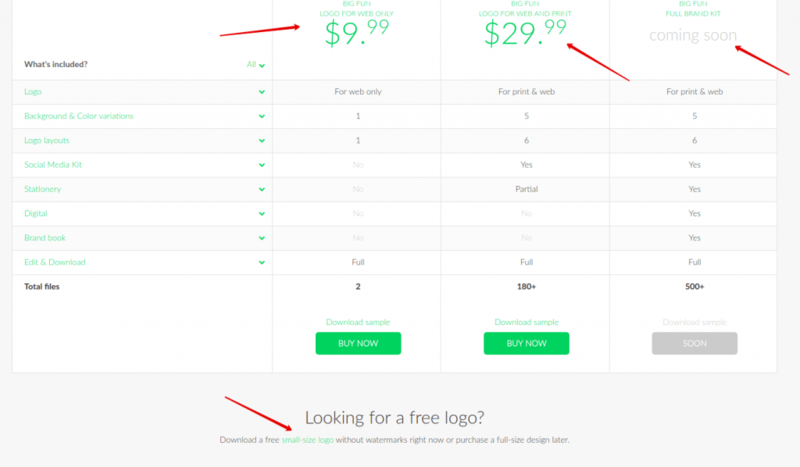 To get your logo, you first need to register a free account. Upon registration, you’ll see what logo files you’ll get under your selected plan. 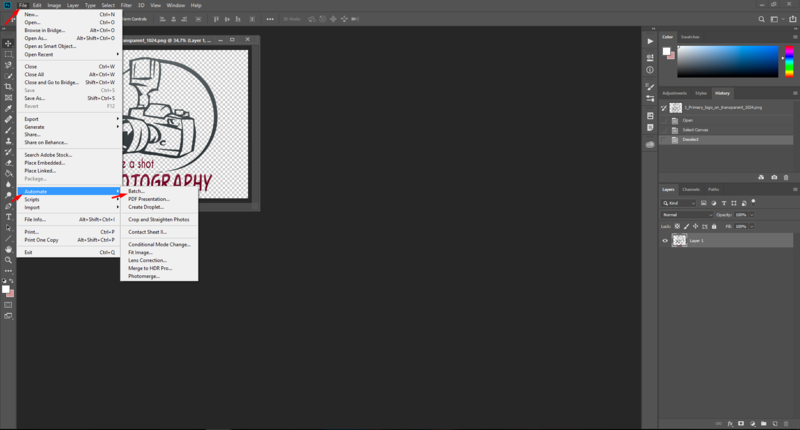 Plus, you’ll see how your logo will look on different marketing collaterals. Click the “Save” button. Also, be sure to check out our pricing page. 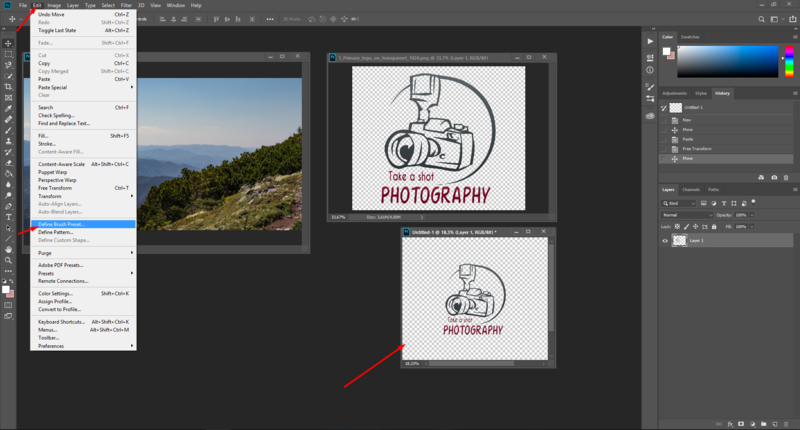 As you can see, creating a professional logo and adding it to your photos is not rocket science. All you need is a little determination and 5 minutes. Protect your artworks and give your photography brand a chance to get noticed among faceless competitors!